Debuting today at INTERMOT, the 2017 Aprilia Tuono V4 1100 gets many of the features added to the RSV4 line this year, namely a revised electronics package which includes the addition of Bosch’s cornering ABS technology. As we saw with the 2017 Aprilia RSV4 RR, the 2017 Aprilia Tuono V4 1100 is now Euro 4 compliant, and has undergone a number of changes to meet those emissions standards, while maintaining its 175hp output. Aprilia is also touting the fact that the 2017 Aprilia Tuono V4 1100 uses the same suspension (Sachs) and brakes (Brembo) components as next year’s RSV4 RR, helping draw the connection from track bike to street bike. ATC: Aprilia Traction Control, adjustable on the fly, (without having to release the throttle) to 8 settings, as well as disabled, thanks to a practical joystick, now even more fine-tuned logic for higher performance operation. AWC: Aprilia Wheelie Control, adjustable to 3 levels, also well as disabled, receives more precise operating strategies thanks to the repositioning of the inertial platform. Wheelie control can now be adjusted on the fly without closing the throttle, like the ATC, thanks to the new and more practical left side electric block. ALC: Aprilia Launch Control, for use on the track only, with 3 settings, more effective with new operating strategies. AQS: Aprilia Quick Shift, the electronic gearbox that allows shifting without closing the throttle and without using the clutch, now adds the capability of clutchless downshifting. APL: Aprilia Pit Limiter lets you select and limit the top speed allowed in pit lane at the track or simply to make it easier to comply with posted speed limits on the road. ACC: Aprilia Cruise Control. The new electronic management allows an advanced cruise control system to be introduced, convenient on long trips, letting rider maintain the set speed without touching the throttle. In addition to these items, the Bosch MSC “cornering ABS” package increases rider safety on the street, allowing riders to push the braking limits while leaned over, without fear of tucking the front-end from braking forces. As a rival CEO once told us, this technology is to the front wheel what traction control was to the rear wheel – a true innovation in motorcycle safety. 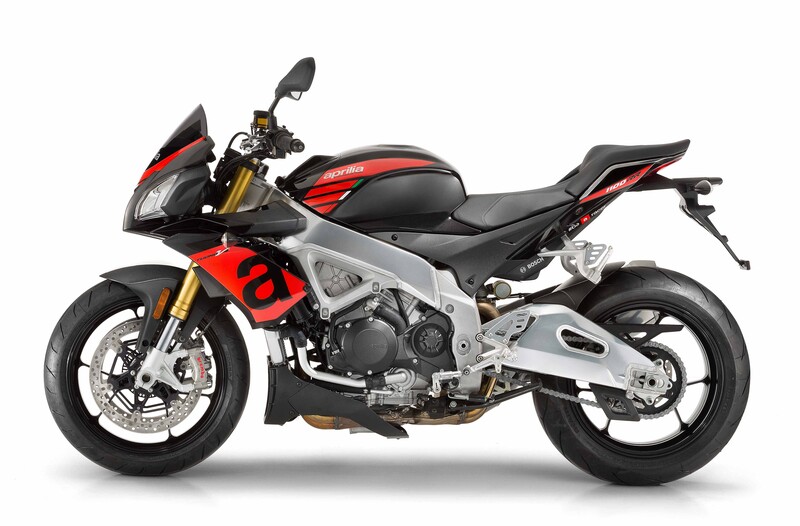 A more noticeable change to the 2017 Aprilia Tuono V4 1100 are the revisiosn made for Euro 4 compliance, the most obvious of which is the new exhaust can, which has a double oxygen sensor and a built in valve. The engine ECU is new too, and because of its superior calculating abilities, the redline on the Aprilia Tuono V4 1100 has been raised by 500 rpm on the 2017 model. This keeps power at 175hp at the crank, with peak torque being 89 lbs•ft at 9,000 rpm. Other internal changes to the piston, con-rod, and combustion chamber help in keeping the Tuono V4 1100 inline with performance goals, while meeting the stringent Euro 4 requirements. 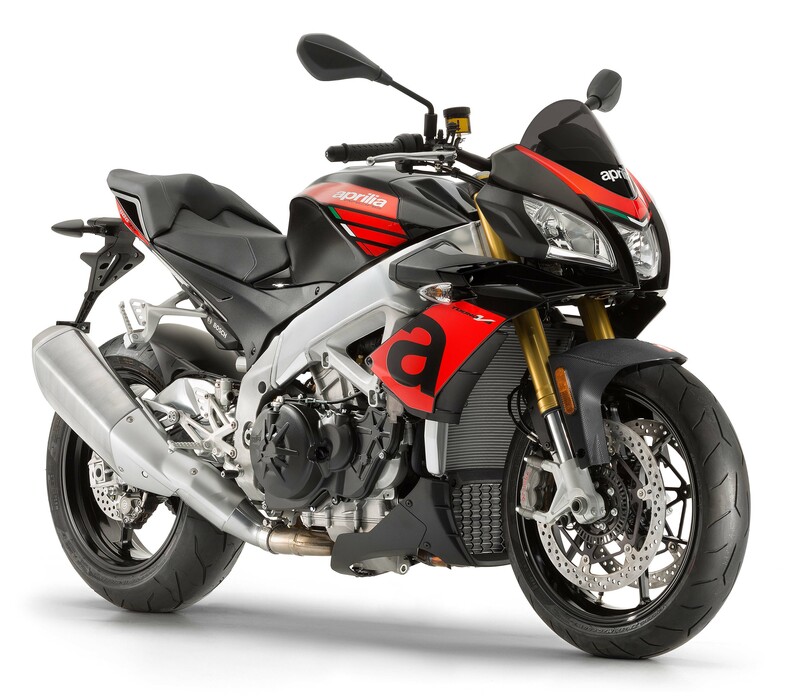 Despite today’s European-centric news, we will definitely see the 2017 Aprilia Tuono V4 1100 in the USA, though Aprilia USA has no information on when, nor for how much.